, the No side had about 54 percent of the vote to 46 percent for the Yes side. Those against independence also scored a big win by strongly taking Aberdeen, Scotland’s oil capital. The average turnout was 86 percent — a record high. Scottish Conservative leader Ruth Davidson told the BBC she was confident the ‘‘silent majority’’ of Scots would deliver a No victory. After the polls closed late Thursday, a nationwide count began immediately at 32 regional centers across Scotland. Many Scots stayed up overnight in homes and bars, awaiting a result that could possibly change their lives, shake financial markets worldwide and boost other independence movements from Flanders to Catalonia to Quebec. Read: Opinion: Precedent or Pandora’s Box? At Highland Hall outside of Edinburgh, where the final result will be announced later Friday, vote-counters at dozens of tables sorted through paper ballots, watched keenly by monitors from the Yes and No camps. Eager voters had lined up outside some polling stations even before they opened Thursday. Turnout totals for a number of regions ranged from 75 percent to over 90 percent, among the highest levels seen in decades. More than 4.2 million people had registered to vote — 97 percent of those eligible — including residents as young as 16. For some, it was a day they had dreamed of for decades. For others, the time had finally come to make up their minds about the future — both for themselves and for the United Kingdom. After polls closed, some No campaigners said they were confident they had swayed enough undecided voters to stave off independence. They may have been helped by a last-minute offer from Britain’s main political parties to give Scotland more powers if voters reject secession, and by fears about the future of Britain’s pensions and the National Health Service in an independent Scotland. British Prime Minister David Cameron was expected to make a televised address about Britain’s future Friday morning after the result is announced. Yet it divided Scots during months of campaigning, generating an unprecedented volume and intensity of public debate and participation. The Yes side, in particular, energized young people and previously disillusioned working-class voters. Many questions — the currency an independent Scotland would use, its status within the 28-nation European Union and NATO, the fate of Britain’s nuclear-armed submarines, based at a Scottish port — remain uncertain or disputed after months of campaigning. One thing was known: A Yes vote would trigger 18 months of negotiations between Scottish leaders and London-based politicians on how the two countries would separate their institutions before Scotland’s planned Independence Day on March 24, 2016. After weeks in which the British media talked of little else, the television airwaves were almost a referendum-free zone Thursday due to electoral rules. On the streets, it was a different story, with rival Yes and No billboards and campaigners outside many polling places. For Smith, who went to the polling station decked out in a blue-and-white pro-independence shirt and rosette, statehood for Scotland was a dream nurtured during three decades living in the U.S. with her late husband. 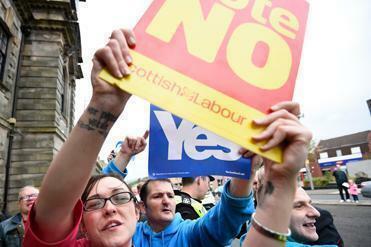 Other Yes campaigners insisted Scots would not allow a return to the status quo, even if the independence bid failed. ‘‘Whatever happens, Scotland is going to be different,’’ said Luke Campbell, a member of the Radical Independence Movement. But some No supporters said the pro-independence campaign had fueled bad feeling among neighbors. ‘‘The country is divided with a hatchet. It’s so awful — and it was completely unnecessary,’’ said Fiona Mitchell, distributing No leaflets outside a polling station. If the Yes side prevails, First Minister Alex Salmond will have realized a long-held dream of leading his country to independence from an alliance with England that was formed in 1707. ‘‘This is our opportunity of a lifetime and we must seize it with both hands,’’ Salmond said in his final pre-vote speech. Pro-independence forces got a last-minute boost Thursday from tennis star Andy Murray, who signaled his support of the Yes campaign in a tweet to his 2.7 million followers. Anti-independence leaders, including former Prime Minister Gordon Brown, himself a Scot, implored Scots not to break their links with the rest of the United Kingdom and stressed the economic uncertainties that independence would bring. There were fierce disputes over whether an independent Scotland could use the pound and several major companies said they would move their headquarters from Scotland to England if the Yes vote prevailed. Many Yes supporters headed to symbolic spots like Calton Hill overlooking Edinburgh, hoping the sun would rise Friday on a new dawn of independence and not just a hangover. Scottish independence is ‘‘the daftest idea I’ve ever heard,’’ he said. 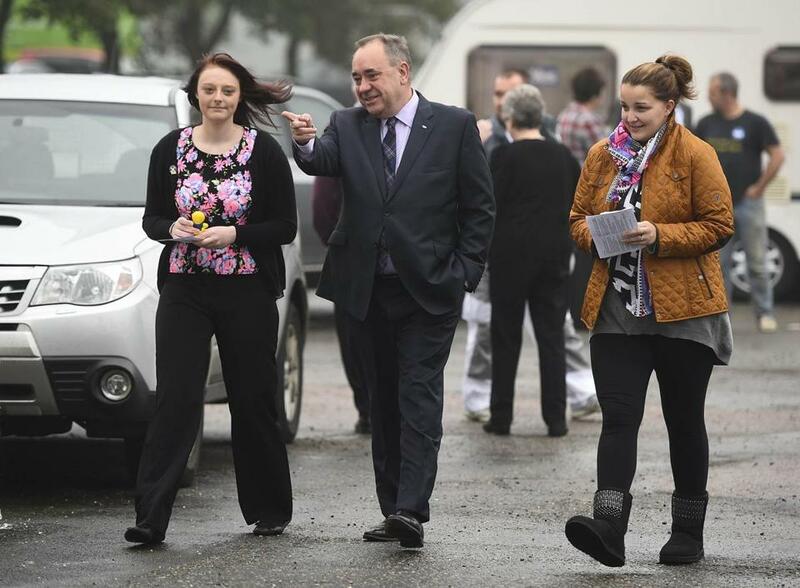 Scottish First Minister Alex Salmond (center) arrived with two first-time voters to place his vote at a polling station in Strichen, Scotland. Salmond is in favor of Scottish independence.